Oh no, an indirect request for a roleplay. Damn, that's bad for me. I shouldn't do it. As if I could hold up another one. Nooooo... You should ignore me. Damn, that's a lot of words i have to look through. I hope to get my posts done within the next two days. Wait, wait, wait. This is an actual page? My body feels weird and I don't know why. Whenever she read a book, she always wondered to herself if her image of the descriptions in the book were close enough to the actual depictions that were supposedly on the cover of the book. Of course, colour was a weird concept to her, but there were still attributes that seemed to surround them. Of course, she was sure that the cover art was not actually entirely done by the author herself and as such the description in the book was sure to be more authentic to the author's mental image. Some thoughts that occurred in her when she started reading her novel was whether or not that Griffon over there was truly staring at her or not. It happened often when she read, ponies and such not being accustomed to the method of braille. Or maybe they figured out that she was blind? That was something that was sometimes a hit or miss. A pegasus mare came in shortly after her and she did not recognise her any more than the rest. The fact that they left her mostly alone instead of trying to greet her immediately was a sign that she was not supposed to know them and it was not a so-called 'brainfart'. She had to suppose that the pegasus was here for the same reason that the other one was, except they did not seem as well, nervous. Her reading was a bit distracted as she paid attention to the pegasus put away her stuff, a sharp sound echoing around the cabin that could be heard by the others if they did not instinctively flush it out. The calm pegasus was the first one to break the relative silence by starting the conversation. So it would seem that it was everyone's first time going to the Crystal Empire, if she understood the calm pegasus correctly. From the reply of the eccentric pegasus, it was clear to her now that they were actually nervous. Nervous probably about that supposed race? What was that word she had heard before, 'Nervouscited?" Quite the portmanteau. "Sure is my first time," She replied taking her attention away from her book. She probably wouldn't need it right now anymore so she put it to the side. "If you asked me a month ago, I would have said it would be crazy for me to go, but I decided that I'd probably go eventually and that time might as well be now. I'm mostly interested in the culture, not the crystals. Although at this point is it right to call it an empire?" She was nearly startled by the sound of the door closing, but her quick internal response stopped her from showing much of one externally. Maybe she wasn't as early as she thought? 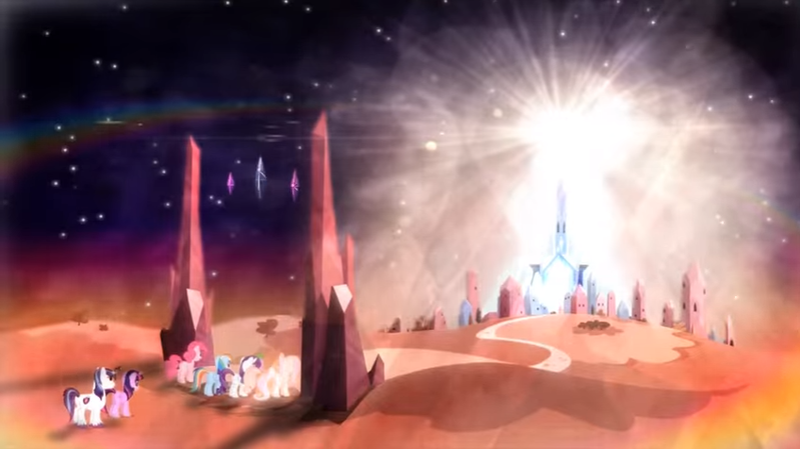 Or maybe there wasn't anypony waiting so they just decided to leave. Wouldn't be good for any latecomers so she decided on the first option. Ah right, so that Griffon was drawing. And now she was asking if she could sketch them. She personally didn't mind, but it had no real benefit towards herself. "Uh yeah sure I guess, I mean, you know, if you really want to. I mean it wasn't like I could really catch you out for doing it," She replied. She knew the Griffon was just asking out of courtesy. "How long do you think this trip is going to take? I'm not trying to sound bored already, but I've only got one book with me and it's kind of supposed to last me both ways." I just realised that each piece of Loose's art are different styles from each other. I've got to continue that trend.